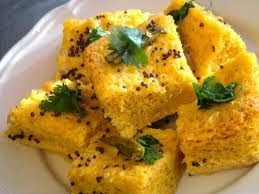 Instant Khaman Dhokla is famous Gujarati dish which can prepare less than 20 minutes. Its very soft and spongy and very easy to prepare. You can serve it with green chillis sauce, tomato sauce or a coconut chutney.You can served it as a snack or in a breakfast. It is very healthy. Try this simple recipe for making this Instant Khaman Dhokla. Sift besan. Mix besan, suji, water,oil, salt, sugar, haldi, chilli paste and ginger paste to a smooth batter of a thin pouring consistency.Beat well. Now, add a eno and soda. Sprinkle lemon juice. Beat well for a few seconds. Don’t over mix. Immediately pour the mixture in the streamer or a dish. Cover dish with cling film and prick at 1-2 places for the stream escape. Microwave for 6 minutes. Give standing time of 5-6 minutes. For tampering mix oil, chillies, rai, water, sugar and lemon juice. Microwave for 4 minutes. Pour over dhokla. Wait for 20 minutes to turn soft.